Summer Solstice is this Saturday! Did you know? Whether you’re hitting the beach, dancing your heart out at the next music festival or sipping a cold-one on the beach, make sure you have summer’s must-haves with you! This “XOXO” necklace from Brevity will go with any and every outfit you where this summer. The Vasto Backpack from Patricia Nash is the perfect summer bag as it is big enough to carry all your essentials and is made of vintage Italian leather, so it can withstand the wear-and-tear of the summer. If the backpack seems to much to carry every day, MADE has a simple zip purse that can fit only the crucial items you need. And don’t forget to accessories if at the beach (or wherever! 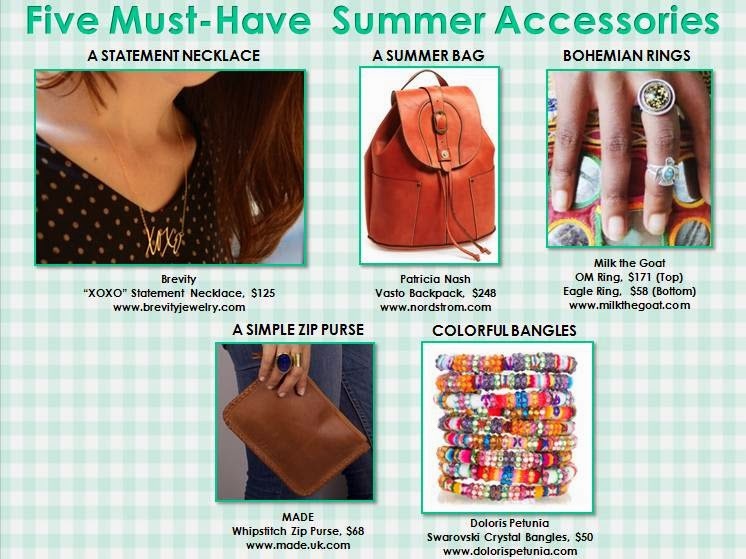 ), these colorful bangles and rings from Doloris Petunia and Milk the Goat, are great compliments to any summer outfit.